The Lindsay-Shapley Ring (AM0644-741) is a large southern ring galaxy, which, like the Cartwheel Galaxy, is host to super starburst clusters that may be analogues of young globular clusters. The collision between two galaxies has resulted in an expanding outer ring, 115,000 light-years across, that essentially contains all of the interstellar matter of the original systems. 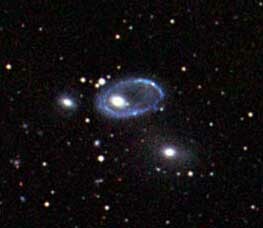 Cataloged as AM0644-741 in the Catalog of Southern Peculiar Galaxies and Associations by Halton Arp and Barry Madore, this beautiful system is also named after after its discoverer. Eric Lindsay, a student under Harlow Shapley, was the first to publish on the existence of the eccentric elliptical ring in 1960. Astronomer John A. Graham first positively identified it as "a peculiar southern ring galaxy" in 1974 by observing the object spectroscopically. Later known as Graham's Ring Galaxy, AM 0644-741 lies nearly 300 million light-years away.